Our service does not end with the burial or cremation. Our Aftercare Program provides many helpful resources to help you in the days, weeks and years following the death of a loved one. We provide families we serve with access to Caring Voices™, giving you a toll free number to call 24 hours a day 7 days a week to speak one on one with a professional grief counselor at no cost. 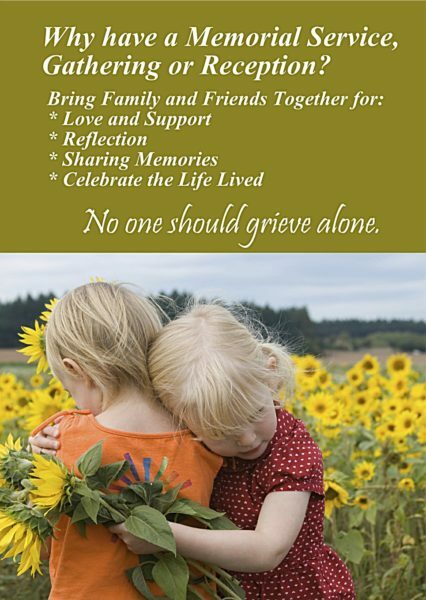 One of the best steps in starting to heal is by taking time to celebrate and remember each person’s life through our Life Celebrations. Also by having a final resting place in our Memory Gardens, everyone has a place to visit and remember, for years to come.